Instant Imprints Vancouver, WA | Custom T-Shirts, Embroidery, Signs and More! At Instant Imprints Vancouver, our customers come to us when they want to be more visible to their customers. We create that visibility five different ways: Branded Apparel (embroidery), Signs & Banners, Promotional Products and Custom T-Shirts. I will always use Instant Imprints from here on out! They have exceptional Customer Service and do amazing work in a very prompt manner. Their staff is professional and caring. I HIGHLY RECOMMEND YOU STOP YOUR SEARCH NOW and CALL THEM! Are you looking to bring your brand promotion to the next level with custom t-shirts, printing services, promotional products, custom banners or branded embroidery items? Then Instant Imprints in Vancouver is the print shop for you! We have the latest production processes to ensure that your product is the best around, and our level of service is second-to-none. Our Vancouver Image Experts are happy to help you, every step of the way! At Instant Imprints, we pride ourselves in providing a superior level of service to our customers. That means we get your job done right the first time, and have it delivered by the time you need it. No matter what the size of your project is, we can handle it—with no order minimums, you can make unique pieces that really stand out. We’re happy to serve Washington with a global level of service combined with the local touch of a Vancouver Image Expert! Custom t-shirts are some of the most popular promotional products out there, and for good reason—they bring your advertising to the backs of your supporters. This is why virtually every major brand has a custom t-shirt design of their own. If you want to hype an upcoming event or push a new product, a custom tee from Instant Imprints can take you there. In addition, our custom embroidery service can give your project an even greater level of style! Have you ever asked your smart speaker, “Where’s the best custom banner shop near me?” If so, you’ll be sure to have found Instant Imprints in Vancouver, Washington! Our Custom Sign Service can help you with any sized project, from small sidewalk signs to massive billboard banners. You can invite passersby into your business with a new storefront sign, or use one of our professional trade show displays to make a splash at your next conference. 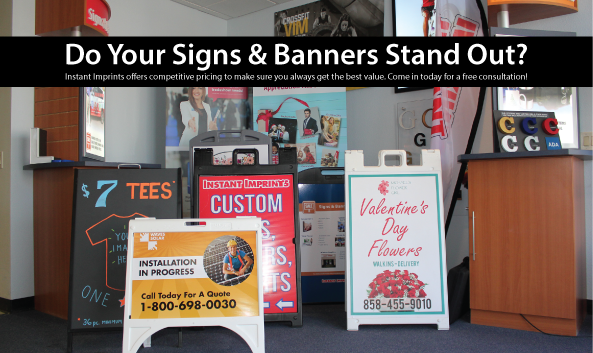 No matter who you’re trying to reach, there’s a sign or banner solution for you! When you’re ready to take your brand visibility to new heights, let Instant Imprints in Vancouver, Washington be your promotional partner. Stop in at our showroom on 3rd Way, give us a call at (360) 694-9711 or request a quote online to get started today!